Welcome one and all. When we started the Savage 24 discussion board we had no idea that it would grow and become so popular as fast as it did, let alone to the point where we would need to build a FAQ list for it. A lot of folks come by the board to ask questions about this uncommon gun which seems to be developing a sort of "under the radar popularity" as an all around foraging and survival gun. If you have a question about the 24 and want instant info, we recommend you check here first before posting an inquiry on the board (which of course you are welcome to do, the board is open to everyone) because your question may have already been answered. #1: "When was my Savage 24 X-Y-Z made?" Or, "What do the different model numbers mean?" This is probably the most frequently asked question on the Savage 24 board by new posters. 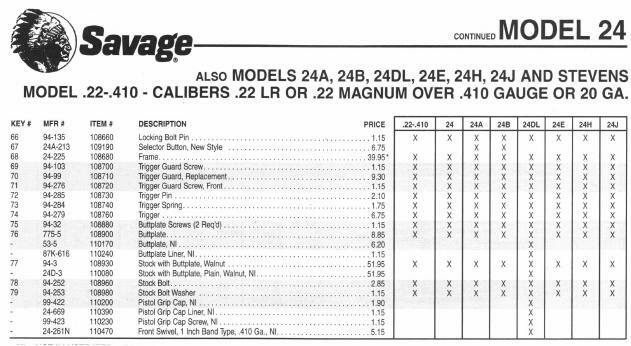 As far as I can determine there isn't a lot of rhyme-or-reason on Savage's model-numbering system for the old guns, and frankly Savage themselves aren't terribly forthcoming with documentation on their older, out-of-print guns. 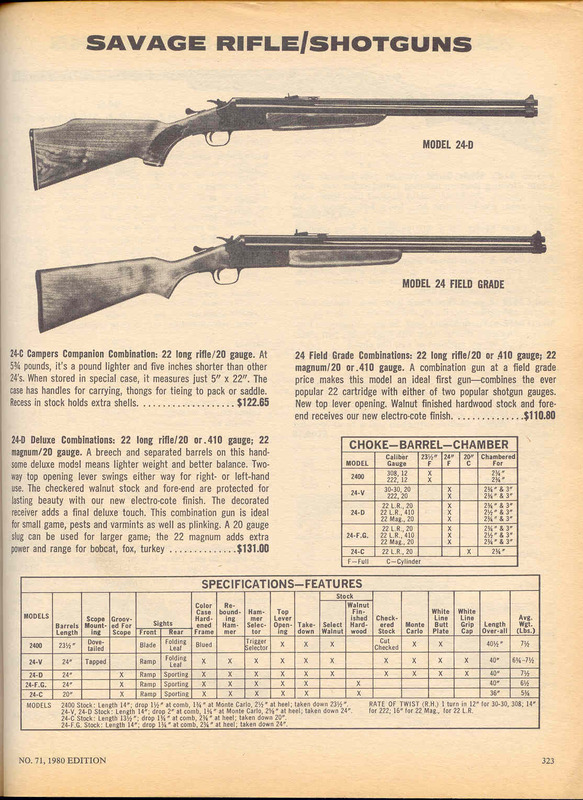 Garry found some old catalog pages that has a few of them listed and I have posted them below. They are in JPEG format. 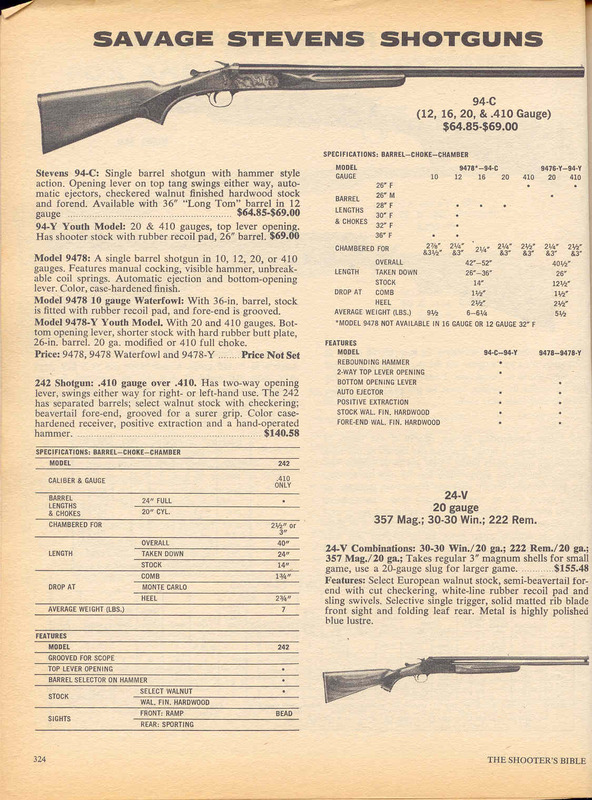 If you have any data concerning the dates of manufacture for the various models of Savage 24 Combo Gun (example: the "24-C" is the "Camper's Companion" model with the ammo trap under the buttplate, but the numbers seem to range from "24-A" to "24-V") please contact us and we will update this FAQ page accordingly. Stevens / Savage date codes. 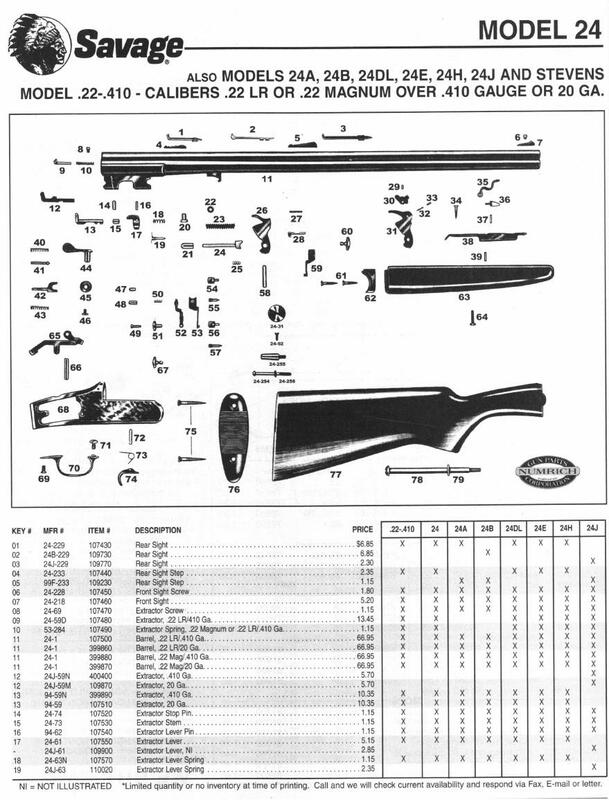 #2: "Do you have any exploded parts diagrams for the Savage 24? Otherwise, a few of these have been provided to us by thoughtful gentlemen who frequent the board. Remember that there have been so many variants of this design--caliber/gauge combinations, etc--that a totally comprehensive list may not be available. 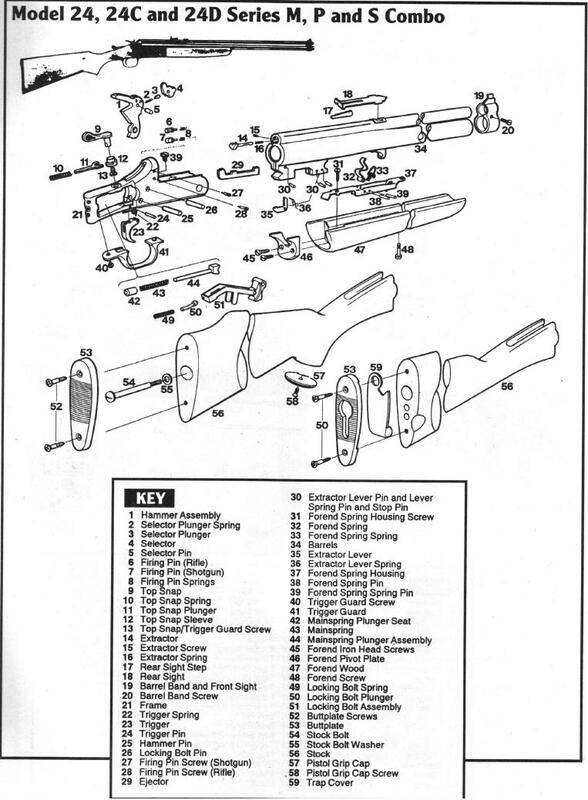 Here are diagrams to a .22/.410 version as well as the 24-V, 24-V-A as well as one which seems to display parts for the C, D, M, P and S versions. The three images on the right indicate that they are accurate for the 24-A, B, C, DL, E, H, and J models. Be advised these are large images and may take a couple of minutes to download on a dial-up connection. They will open in a new window. These two new ones were thoughtfully provided by Garry W. They are large and will open in a new window as well, so if you have a slow connection they may take a few minutes to load. #3: "My gun has light strikes, how can I fix it??" Here's one possible, common problem and the fix. #4: "Where can I find parts for my Savage combo gun?" This topic has also been discussed on the discussion board at some length. 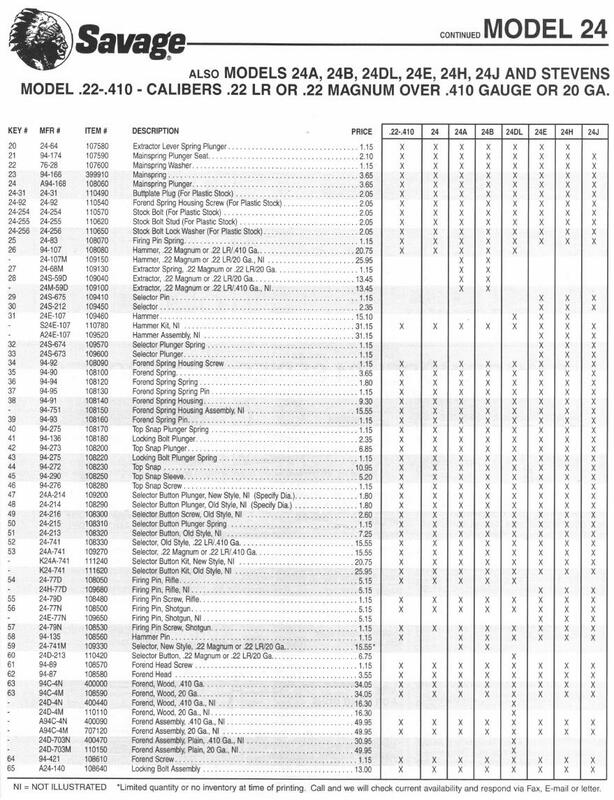 Here are a list of links to parts dealers who may be able to sell you that hard-to-find "fore-end spring retention spring" or spare firing pin for your 24. #5: "Where can I find accessories (cheek pads, brass, etc.) for my 24?" #6: "Are there aftermarket sights for my 24?" It would seem only out of production models, though you can keep an eye on Gunbroker and Ebay for them. The Redfield peepsight model is: RE-24 and the Williams peepsight: WGRS-24. You may need a higher front sight to use these with some models. #7: "Can I fire my 24 shotgun barrel with the scope attached?" There are a couple schools of thought on this. Despite Savages warning printed right on the barrel, many people do so and have done so for many years. There are a few theories why Savage put this on the barrels, all pretty much coming back to liability. Many old .22 dovetail mounts weren't particularly strong. Nor were the scopes themselves for that matter. As well ".22 scopes" tend to have very short eye relief and aren't intended to be used on guns with any real recoil. With all these factors, Savage probably decided to play it safe and warn against using the shotgun barrel with the scope attached. Many people report having zero issues (with the scopes staying on the guns) when using quality mounts. Whether you should or not is up to you. #8: "Can I fire slugs in 24 shotgun barrel?" #9: "What choke is in my gun?" The 20ga barrels seem to all be modified, accept for the Camper C models, which are cylinder bore. As for the .410 and 12ga??? Got a suggestion for the Savage 24 FAQ page? Click here to go directly to the board itself and tell us.